I know what you are thinking. The words "healthy" and "nachos" do not belong together in a sentence. But, Snack Girl has been sent a new product that has changed her mind. I get a lot of products mailed to me and I try them all. This one, Nacho Mom's Ultimate Vegan Queso, seemed to be like something that I would hate. The ingredients (tomatoes, water, nutritional yeast, unbleached flour, green chiles, paprika, salt, garlic powder, citric acid, calcium chloride and spices) are all ones that I recognize but I couldn't understand how it could taste like CHEESE. True confession: my favorite unhealthy snack is nachos (followed by donuts). I can't resist them! I love the crunch, and I love the cheese. An order of classic nachos at Chili's is 1600 calories with 50 mg of saturated fat. 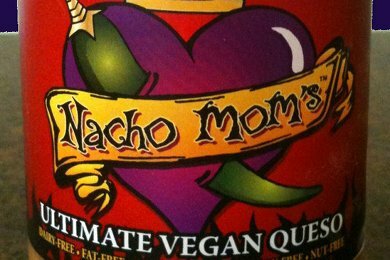 Enter my new friend: Nacho Mom's Ultimate Vegan Queso! The entire 16 ounce jar is only 160 calories!! For you Weight Watchers fans out there, the ENTIRE JAR is 2 points. When an award-winning Texas chef goes vegan, everything good happens...except for the cheesy Tex-Mex cravings that wouldn't go away. When no other recipe or product in the universe came even close to "the real deal" of mom's cheesy queso recipe, hours in the kitchen perfecting the ultimate vegan queso resulted in the mind-blowing all-natural queso perfection with the same Southwestern taste and creamy texture, but better. Chef Alana has made something revolutionary. It tastes like cheese mixed with salsa that go on nachos. Honestly, the taste and texture is very close to the original. Of course, your next problem is going to be the chips, so if you keep it down to 10 chips - your entire serving of nachos (without sour cream or meat) is going to set you back 150 calories. You could eat the ENTIRE bag of chips and a jar of this stuff for 1200 calories. (I am not suggesting you try that :). Who needs chips? You can use it on your steamed broccoli, as a dip for crudites, served on a baked potato, or mixed in your Beans and Rice. Use it where you would like a spicy cheese to make things creamier. Currently, you can find it mostly in Texas or online (see: where to find vegan queso). Alana has managed to get her product into Whole Foods in January. A jar will set you back $4 and there is $7 for shipping depending on where in the country you live (and how many jars you order). I know the price is steep, so you might have to wait until it shows up in a store near you. How do you deal with cheesy cravings? Also, I like melting two triangles of Laughing Cow Queso-and-Chipotle - that's only 70 calories and they're pretty close to tasting like restaurant queso. Mmm that sounds so good! I like making on my own vegan cheezy sauce out of nutritional yeast flakes, but it is SO nice to have store-bought versions there (because too often, my priorities fall by the wayside or I'm not in the mood to cook :)). Sounds awesome! If you're looking for a good cheese substitute till then, look at Whole Foods for Daiya "cheese" - you could mix the cheddar shreds with salsa for the same effect! Also, you could eat this with baked tortilla chips and be able to eat more!!! I personally don't think baked chips are too different from the regular. I so wish I had a Whole Foods near me! This sounds yummmy! I've gotten lots of emails since this article...yay! We have been accepted as a product UNFI (Natural Foods Distributor) will carry so we can go into any natural grocery store within a month or so once all paperwork is done and order is picked up. Until then, we can direct ship to your grocery store. They simply have to email us at info@fatgoblin.com to request it. If you don't wish to fill out a product request form at your grocery store, our website has the list of online stores you can order it from. If you order a certain amount, you get free shipping (and there is no tax) so go in with some friends and order a bunch or order the Nacho Mom's Ultimate Vegan Queso with other products and you can have some at home within the week! It's all natural, but shelf stable for 6 months so stock it in your pantry whether you have a local store carrying it or not. But be patient...the response we've gotten from buyers has been TREMENDOUS so we should be in a store near you soon...the more requests stores get for it, the more likely they are to carry it full-time, however so please ask if you love it and want it! also, i really wanna try the recipe Marla linked. too bad i don't have a blender. hmmm time to invest in one! Awesome! Can't wait to get a box!! I'm newly Vegan and I must tell you tha cheese is one thing I miss SO much!! Gotta get to ordering!! Thanks for this post SnackGirl!! I'm not vegan but this sounds yummy. I like to use real shredded lowfat cheese (not saucy) and either vegetarian chili or refried black beans, salsa and greek yogurt on my healthy meal nachos... and I guess I'm weird but I also add shredded cabbage... By the way, baked chips sometimes have a slightly odd texture/aftertaste I don't care for. Trader Joe's has a nice compromise of "Reduced Guilt" tortilla chips. 14 chips is 1 ounce: 120 calories, 4 g fat... not bad! Just ordered 2 jars - sounds too good to wait for it to reach the Midwest! Thanks! "How do you deal with cheesy cravings?" I eat some cheese? Good stuff and not too much of it... works for me. We usually make our own baked chips using La Tortilla Factory Low Carb/High Fiber Tortillas. They are only 80 Calories per wrap and are cholesterol-free, contain no saturated fats, trans fat or hydrogenated oils! to be honest REAL NACHOS DON'T TASTE LIKE CHEESE! I mean C'MON... unless you ARE using REAL cheese, nachos are usually made with the processed oil concoction, that really should not be called cheese. WHAT AN INSULT to the gloriousness that is CHEESE!